Much has been made of the recent advancements in the nature of artificial intelligence and machine learning, but aside from a few notable exceptions that tread the line between a fun toy and actual art (here's looking at you, Deep Dream), it hasn't really touched the art world. Many artists are fascinated by technology and explore related themes in their work, whether it's incorporating the machines themselves or taking advantage of what the machines allow them to do. 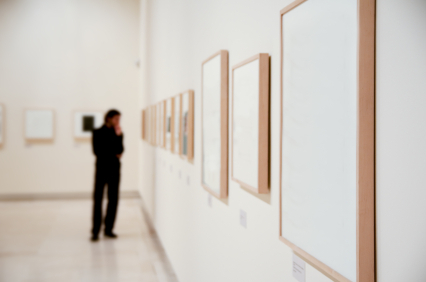 This is perfectly understandable, but as the intelligences grow smarter, the scope of their role in the art world is likely to change dramatically. Perhaps the first example of this shift comes courtesy of a collaboration between Microsoft and the Tate Britain museum in London. An exhibit in artificial intelligence dubbed 'Reaction' recently captured the annual IK prize for its exploration of the applications of machine learning to the art world. Produced by a trio of developers working at Fabrica, Angelo Semeraro, Coralie Gourguechon and Monica Lanaro, and in collaboration with Jolibrain, a group of France-based AI specialists, Reaction isn't actually an exhibit, it's 'an autonomously operating software programme'. The majority of the exhibit is the result of its abilities. Wednesday 20th July 2016Will Magenta Make 'Art'? One of our favourite topics here is the development of artificial intelligence and whether or not a machine can be taught to be creative. We've looked in detail at the infamous Deep Dream project by Google, which uses a neural feedback loop to generate images, and how it can be manipulated by conscious human artists to create incredible images. But what about the next step forwards? If it's possible for an adaptive neural network to 'learn' how to create images, can it be taught how to create other forms of art? If so, is it technically being 'creative', or is it just regurgitating all of what it has been fed? The real question is whether or not that's really any different than what we human artists do, those of us who are (usually) generally accepted as having a creative talent. Are we driven purely by everything that we have experienced or is there some innate spark of creativity, a unique genesis within us that allows us to truly create new things? Google has launched a new machine learning project named Magenta with the hopes of exploring the possibilities of a creative machine. So far, a number of researchers have joined the project, and some interesting work is already being done. Douglas Eck, one of the researchers currently attached to the Magenta project, explains his curiosity about machine learning on his Google bio page: "Hypothetically, if we showed a piano-playing robot a huge collection of Chopin performances--- from the best in the world all the way down to that of a struggling teenage pianist---could it learn to play well by analyzing all of these examples? If so, what’s the right way to perform that analysis? In the end I learned a lot about the complexity and beauty of human music performance, and how performance relates to and extends composition." During a recent panel at the Moogfest music festival, he commented, "There's a couple of things that got me wanting to form Magenta, and one of them was seeing the completely, frankly, astonishing improvements in the state of the art. And I wanted to demystify this a little bit." No matter what the results wind up being, it's an exciting time to be an artist! The nature of creativity has long been one of the most appealing human mysteries, and the ability to teach a computer the concept of creativity is truly amazing.